You would be crazy to miss these 4 Winter Events in #Wisconsin! With these sub zero temps, who can blame us for wanting to find something good about winter? It doesn’t have to keep us inside and miserable with the cat that has allergies (just saying). It can be exciting and fun. These events are just a few (but really stellar) that you should escape to. Just wait and see. This is Wisconsin’s 25th year in being the People’s Choice competition for snow sculpting. Winner goes to the U.S. world championship! 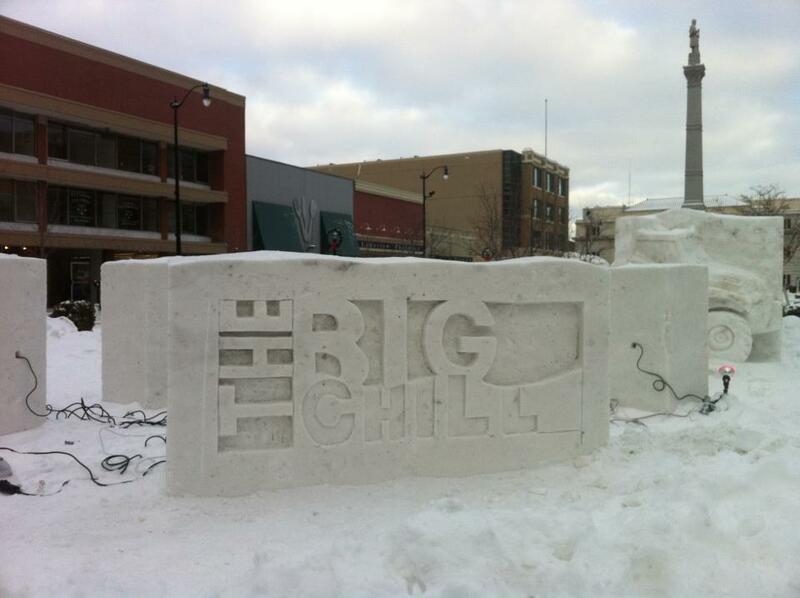 Enjoy family fun friendly activities and snowboarding to the Big Chill in downtown Racine. Enjoy the Rail Jam!! 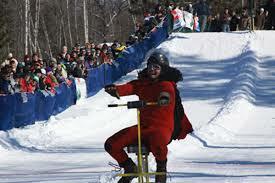 Thousands of visitors each year, make this one of the most successful winter events in Wisconsin. Between fun runs and speed runs, shootouts and fly racing ice drags, this is the crowd with a need for speed, and perhaps, beautiful women and beer. The radar run highlights some of the fastest and most groomed tracks in the Midwest. 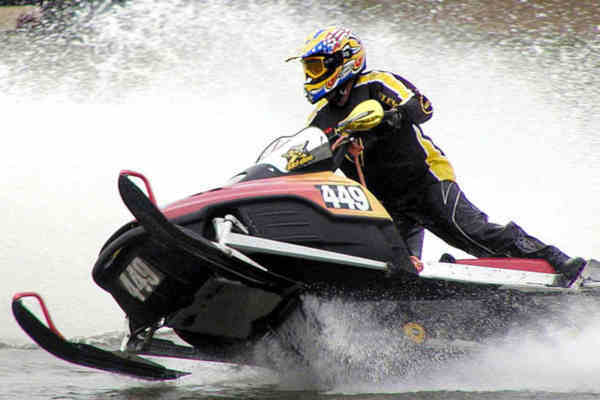 Watch the demo rides, the Bikini race and drink a beer in the Sprecher beer tent if observing is more your thing. It’s hard to really explain, so watch the video here! Phillips comes alive during Winter Fest with snowmobile races, parades, lawn more races (yes, that’s what we said, lawn mower races), face painting, ice fishing, snowshoeing and fireworks. Any of those strike your fancy? Maybe Tug of War will peak your interest, that can only be real fun in the winter when you knock the other team off balance. As if it isn’t weird already, they even have a keg toss competition. Check out the event at: EventCrazy. This is a true “Up North” experience you should tell all your southern friends about. Nothing says I love you like spending Valentine’s day racing bar stools down a snowy hill but hey, is it ever fun?? Rules are pretty simple, there is beer at the end and cash prizes. We’re sold! Don’t quite get it? There is a video on their website! A new crossbow law is being tested. Previously, hunters that were above the age of 65 and/or had physical disabilities were able to crossbow hunt. This new law lets hunters opt for the crossbow — the law will be tested for three years to see what will come of it. Some say that the crossbow is too efficient and will lead to an overkill of the deer population and will shorten the length of deer season. Only time will tell to see if this will be a permanent law. In the meantime, we can expect more deer hunters to join in on the experience of DEER CAMP, and we know just the places to set up camp. One of the highest deer population rates is in Shawano County. The county has reported a deer population of 52,700. Shawano is a small city of about 9,000 people and offers a lot in recreation and quality deer hunting. The forests, farmland and marshes make this area great for sizable whitetail deer. It is against the law to feed deer in this county but with the population the way it is, you should have no problem bagging one. Ten miles away sits public land over 14,500 acres called the Navarino Wildlife Area. This area is one of the most densely populated areas in the state. When thinking about staying here, check out Adventure’s Cabins. These cabins sit on Lulu Lake, which makes it perfect for fall fishing as well. After your full day of outdoor activities, your group can sit in front of the wood burning fire stove and ‘make a plan for tomorrow’. There’s even a washer and a dryer. This property comes with a fire pit, private dock, canoe and rowboat. Next we head straight over to the other side of the state along the Mississippi river in Buffalo County where many areas are heavy with deer, turkey, waterfowl and pheasant populations. Buffalo County is home to roughly 32000 whitetail deer becoming the forefront of the nation in deer size, recording 309 “wall-hangers” in just 10 years! It’s safe to say that after the hunting season, you won’t be disappointed. On that note, we have cabins in Buffalo County that will fit your needs. Fountain City, a small town right on the river and claims to be the “River Bluff Capital of the World”. There you will find HNL Farms: Heritage House. This home is a nice, peaceful and relaxing homestead where you can cook on the grill, or head to town for a good bite to eat. Use the fire pit at night and tip back a couple — it OK to dream about which wall you’re putting your next trophy buck on. If you have some young hunters; there’s even a clubhouse and game room not too far off! There is also Cross Ridge Retreat in Fountain as well. This retreat boasts vista like panoramic views of wildlife and the Upper Mississippi River valley all seen by the three season porch. Relax and enjoy the heated clubhouse with a bar and game room. If there is an early snowfall, this retreat is right on the Buffalo County Snowmobile trail. If we head back to a more central location, Tomah, you will get a chance to see some of the state’s best deer hunting. This area has predicted 28,600 deer for this upcoming year. It’s absolutely beautiful and is a great low stress environment with plenty of marshy grounds. These Tomah cabins put you in Deer and Bear country. If both deer and bear sound good, stay a few days in the Tomah area. The Bald Eagle Lodge in Warrens, WI can sleep over 20 people so bring the family and friends along! This is absolutely perfect! There are two kitchens, two private decks and a patio. This rental is perfect for a family get together where the fun can be shared AND separate at the same time. While the men hunt in the nearby Black River State Forest, the rest of the family can enjoy the Lodge amenities, head to town, or even do some horseback riding. Hunters enjoy all that Wisconsin has to offer because it is truly paradise. To learn and get engaged with more Wisconsin hunting or even to see what Wisconsin Outdoor Fun is all about, head over to WisconsinOutdoorFun.com! Grab your friends or family and make your hunting trip memorable. Stay at a great Wisconsin Vacation Rental! See our entire selection at RentWisconsinCabins.com – you’ll love the Narrow Your Search tool and the interactive Google Map. The best part is — you always connect, plan and book directly with rental owners or managers to get the best rate. Did you hear? We recently launched 3 other state-specific vacation rental websites for Minnesota cabins, Michigan vacation rentals, and even New York cottages! Check them out.